Lets go Yankees!!! Game 5…do or die. Win or go home (even know they are home). Should be a good one and I know exactly where I will be at 8:07 pm tonight. For the time being though, it is time for my next beer. Beer #312 is Stone Sublimely Self-Righteous Ale by Stone Brewing Company. You have to love those names Stone gives their beers. This American Black Ale is brewed in Escondido, California and has an ABV of 8.7%. It poured a very dark brown, it could have been black. When I held it up to the light it had a faint ruby red color. It had a nice light brown head sitting atop of it. The nose was pine and grapefruit. It had a very nice floral smell to it also. Throw in a lesser aroma of dark roasted malts similar to coffee and I thought it was one fine smelling beer. It started with the malts in the taste with a nice bitter black coffee taste with a bit of vanilla. It worked its way to being quite hoppy with pine being the biggest flavor. The coffee comes back at the end and into the aftertaste. It was nice and bitter but not over the top like some of Stones offerings. The body was leaning much more to the heavy and sticky and syrupy side. It had an ample amount of carbonation. For the high ABV, this was quite drinkable with the alcohol content hidden very nicely. This was an excellent brew. This was very yummy…I really enjoyed the mixing of the dark roasted malts with the IPA qualities. Find it…drink it…enjoy it!!! Oh yeah…go Yanks!!! Beer #152 is L’Exploratrice Hoppy Porter by Brasserie Trois Dames. This beer hails from Switzerland and is brewed in the style of an American Black Ale. The ABV checks in at 5.3%. This swiss beer was brown and atop that brownness was a little white head. The nose was muted to say the least with faint aromas of roasted malts and citrus. The citrus had more of an orange scent that kind of surprised me. The taste was more pronounced than the nose. The malts came through first and foremost with a sweetness of caramel and a slight bitterness of coffee. Near the end of the sip the hops could be found with that familiar pine like flavor. It did have a bit of an aftertaste not unlike coffee. Medium body, sort of slick, and light carbonation made up the mouthfeel. Pretty drinkable beer we have here. This was OK…nothing really spectacular here. It did not live up to the Hoppy Porter that was indicated on the label. For me it was missing the smoky intense roasted malt flavors of chocolate and coffee that I think of when I think Porter. It also wasn’t very hoppy at all. All wasn’t for naught though, I’m glad I had a chance to try a beer from Switzerland. 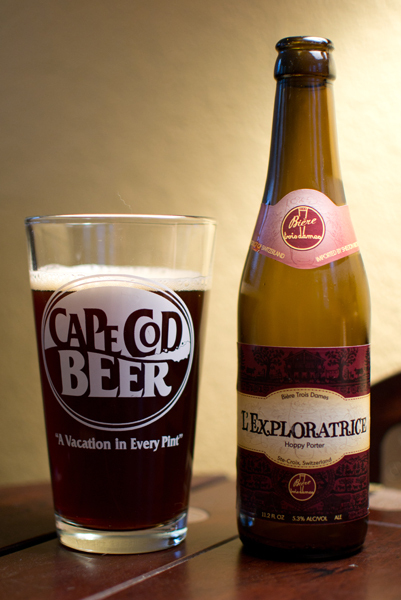 A Vacation in Every Pint…I love that saying on the pint glass from Cape Cod Beer that brew #135, Longshot Blackened Hops by Samuel Adams, went into. We all know that Sam Adams is brewed in Boston, Massachusetts (at least I think we do) and this concoction is an American Black Ale with an ABV of 7%. This is part of Sam Adams Longshot series where a homebrewer can get his or her beer brewed by said brewer after winning the Longshot competition. 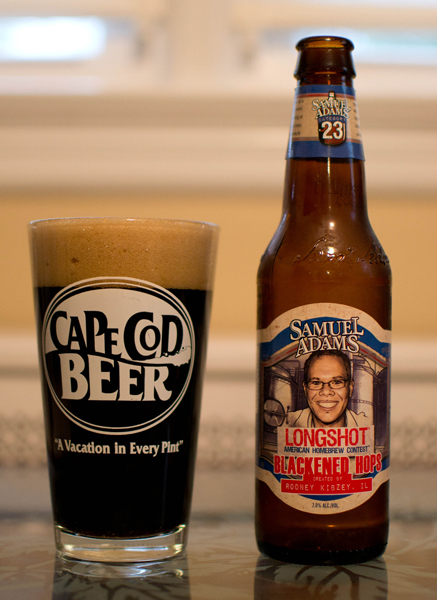 Interesting to note that Sam Adams has been doing their Longshot series, a competition really, since 1995 and they pick two or three winners every year. Those winners get their homebrew brewed, their face on the bottle label, and I would assume some sort of compensation and notoriety. Not too shabby. Tonight beer was from one of the latest winners in 2010, Rodney Kibzey. This brew was a dark brown or more like black with a nice sized tan head that left some awesome lacing on the side of the glass. It looked really good and smelled really nice just from opening the bottle. The nose was very pleasant…citrus, hoppy, grapefruit…smelled delicious. The taste surprised me, the hops take a back seat to the malts here, but not by much. There were lots of roasted malts flavors, like coffee, with some nice pine and grapefruit flavors, all finishing with a nice bitter bite. The mouthfeel was smooth, a bit creamy, had a bunch of carbonation, and a medium body bordering on heavy, almost coating the mouth. Excellent drinkability, that 7% was hidden well, I wanted another after this was gone. This surprised me…it is by far the best thing I have had with the Sam Adams name on it. I wasn’t expecting a whole lot but Rodney Kibzey from Illinois, this was delicious and satisfying. This is right up my alley, IPA like but with a nice roasted malt quality. It is a shame that this is a limited run as I could see myself getting this frequently. One last word on this…yum!